severe testing : beyond Statistics wars?! Another subtitle of the book could have been testing in Flatland given the limited scope of the models considered with one or at best two parameters and almost always a Normal setting. I have no idea whatsoever how the severity principle would apply in more complex models, with e.g. numerous nuisance parameters. By sticking to the simplest possible models, the book can carry on with the optimality concepts of the early days, like sufficiency (p.147) and and monotonicity and uniformly most powerful procedures, which only make sense in a tiny universe. The section (Tour IV) on model uncertainty (or against “all models are wrong”) is somewhat limited in that it is unclear what constitutes an adequate (if wrong) model. And calling for the CLT cavalry as backup (p.299) is not particularly convincing. It is not that everything is controversial in SIST (!) and I found agreement in many (isolated) statements. Especially in the early chapters. Another interesting point made in the book is to question whether or not the likelihood principle at all makes sense within a testing setting. When two models (rather than a point null hypothesis) are X-examined, it is a rare occurrence that the likelihoo d factorises any further than the invariance by permutation of iid observations. Which reminded me of our earlier warning on the dangers of running ABC for model choice based on (model specific) sufficient statistics. Plus a nice sprinkling of historical anecdotes, esp. about Neyman’s life, from Poland, to Britain, to California, with some time in Paris to attend Borel’s and Lebesgue’s lectures. Which is used as a background for a play involving Bertrand, Borel, Neyman and (Egon) Pearson. Under the title “Les Miserables Citations” [pardon my French but it should be Les Misérables if Hugo is involved! Or maybe les gilets jaunes…] I also enjoyed the sections on reuniting Neyman-Pearson with Fisher, while appreciating that Deborah Mayo wants to stay away from the “minefields” of fiducial inference. With, mot interestingly, Neyman himself trying in 1956 to convince Fisher of the fallacy of the duality between frequentist and fiducial statements (p.390). 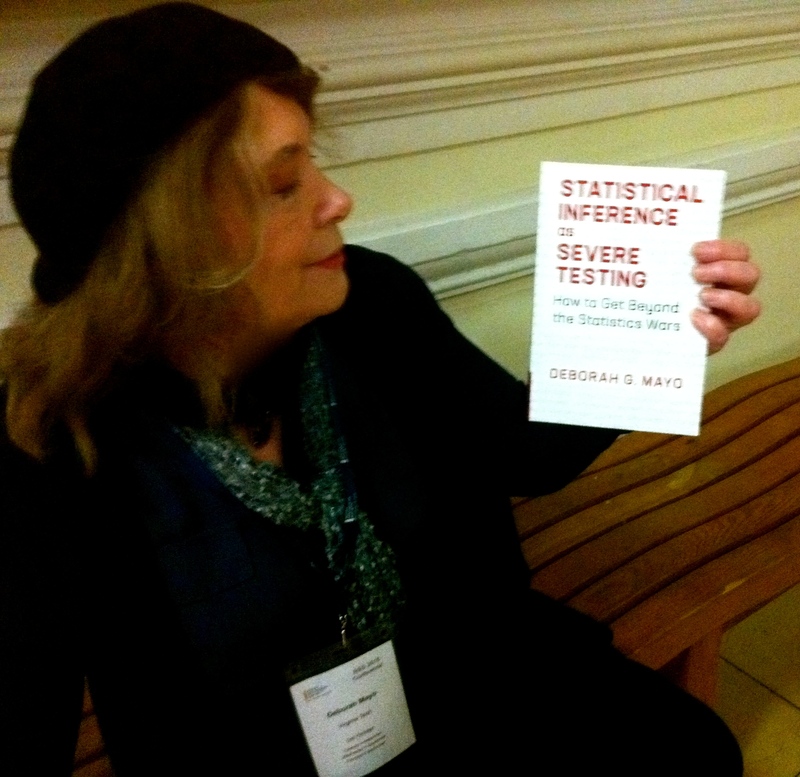 Wisely quoting Nancy Reid at BFF4 stating the unclear state of affair on confidence distributions. And the final pages reawakened an impression I had at an earlier stage of the book, namely that the ABC interpretation on Bayesian inference in Rubin (1984) could come closer to Deborah Mayo’s quest for comparative inference (p.441) than she thinks, in that producing parameters producing pseudo-observations agreeing with the actual observations is an “ability to test accordance with a single model or hypothesis”. A special mention to Einstein’s cafe (p.156), which reminded me of this picture of Einstein’s relative Cafe I took while staying in Melbourne in 2016… (Not to be confused with the Markov bar in the same city.) And a fairly minor concern that I find myself quoted in the sections priors: a gallimaufry (!) and… Bad faith Bayesianism (!! ), with the above qualification. Although I later reappear as a pragmatic Bayesian (p.428), although a priori as a counter-example! This entry was posted on January 7, 2019 at 12:19 am and is filed under Books, pictures, Statistics, Travel, University life with tags Albert Einstein, book review, Cambridge University Press, cup, Deborah Mayo, Don Rubin, Egon Pearson, Emile Borel, gallimaufry, Jerzy Neyman, Likelihood Principle, Markov bar, Melbourne, R.A. Fisher, severe testing, statistical inference, Statistical Inference as Severe Testing, sufficiency, testing of hypotheses. You can follow any responses to this entry through the RSS 2.0 feed. You can leave a response, or trackback from your own site. Yes, apparently the way to get beyond the statistics wars is to identify (the upper bound of) the capacity of methods to probe for errors with their frequentist error rates and then to declare victory for frequentist methods by fiat. Well, that’s one way, I spoze… but nevertheless I remain in the trenches, giving the severity concept as much philosophical charity as I can manage and still finding it lacking. Regarding nuisance parameters: On the one hand, Mayo’s more statistically informed collaborators like Cox and Spanos dismiss the issue of nuisance parameters rather breezily, pointing to those nice conditions you note. On the other hand, it would be fairly straightforward to apply severity reasoning in the context of more modern frequentist methods, some of which work around nuisance parameters, e.g., the bootstrap, and others of which work well even in their presence, e.g., higher order likelihood inference. So I’m mostly inclined to give Mayo a pass on that point. I have some critical blog posts exploring the severity concept in the works.